I just returned from Orlando, where I attended (for the first time) the annual conference of the International Association of Emergency Managers (IAEM). 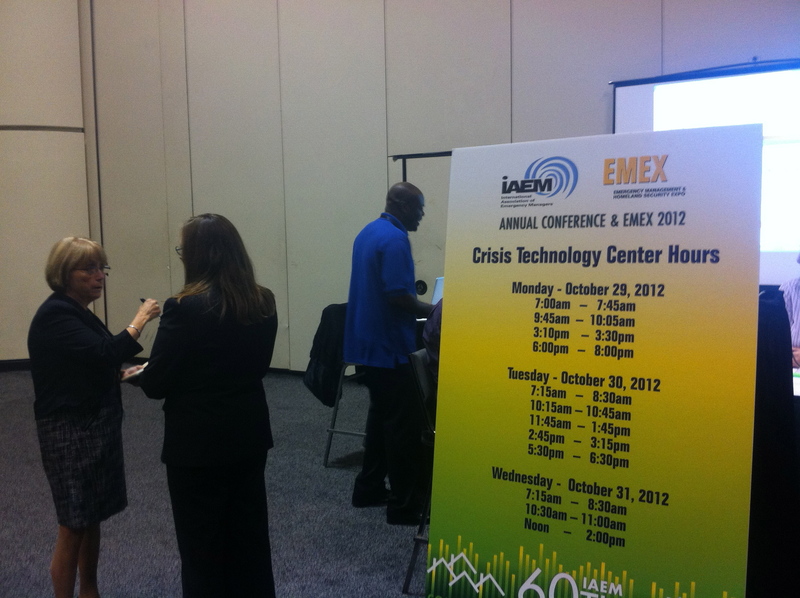 While there, not only did I attend about a dozen sessions, but I also had the pleasure of volunteering at the Crisis Technology Center (CTC) hosted by the IAEM Emerging Technology Caucus. Almost every session mentioned social media. Whether it was Facebook, Twitter, YouTube, blogs, photo-sharing sites, or other new technology, social media was constantly being mentioned. At the same time, it is clear that the emergency management field is still easing itself into the social media pool. For every social media enlightened emergency manager, I would estimate that there are about 10-15 that have no idea what social media is. In other words, the emergency manager that uses social media is still in the minority. Enterprising emergency managers, like those of us in the Crisis Technology Center, are trying to change that. Throughout the conference, the CTC answered countless questions and explained/demonstrated social media. While the field is definitely heading towards more open engagement with the communities we serve, new technology is still viewed with some skepticism. The title of this year’s conference was “resiliency”. I counted about 5-6 sessions that had “resiliency” in the title, but other than being mentioned in the title, sessions rarely mentioned the term again. In discussions I had with other emergency managers, resiliency was rarely mentioned. It seems like a good buzzword, but (as a field) we’re slowly adopting the topic and slowly growing to understand what resilience means to our programs and the whole community. Reductions in funding have changed local priorities from all-hazards plans to risk-specific planning. Rather than having general plans that cover many different topics, risk-based plans account for the incidents/damages that are most likely to impact your community. With the new THIRA guidelines, upcoming frameworks, PPD-8, and the new National Preparedness Goal and National Preparedness System, the emergency management field is still in a state of major doctrinal refinement. The major changes in doctrine pose significant increases in the level of effort required by organizations at all levels of the “whole community”–but it appears the changes will be positive in the long-term. I think the field will need to reconcile the emerging hierarchy of plans, goals, systems, and frameworks–but that will all come with time. This past week, the US was hit with Superstorm Sandy. I’ve been awed by the pre-positioning of supplies, the timely alert and notification, and the prevention of major loss of life. The loss of property was unavoidable, but it was the heroic actions of first responders and others that prevented a catastrophic loss of life. I know several emergency managers that literally walked to work during the hurricane to ensure as robust of a response as possible. Although terrible, Sandy brought out the best in Americans and I’m convinced that the damages from this storm can be an opportunity for the US to rebuild better than ever before. 1. I definitely agree that most Emergency Managers don’t understand social media and many of them never will. This reflects the ongoing growing pains as EM tries to be more of a professional discipline but is still practiced by many people (mostly 1st responders) who “fell into” the job. 2. Good insight. Resiliency is a buzzword. The field needs to flesh this term out or drop it. 4. I hope the move toward risk based planning is a sign of the maturation of the all hazards planning that had previously been pushed. Hopefully Ems are seeing that they have a solid all hazards approach and now they can refine their planning to deal with specific threats and allocate resources based on the probabilities of those threats occurring. Hopefully we won’t abandon all hazards planning since it delivers the biggest bang for the buck. 5. Hopefully changes will always be coming. EMs should be agents for positive change in their organizations and communities. We need to continually adapt and change to deal with new threats and vulnerabilities. Thanks for the thoughtful comment, Brian! 3) Why do you consider the preparedness goal ludicrous? What do you mean by “break glass in case of emergency”? Well said about being agents for change, I definitely agree. Thanks again for you comments! I think real resilience can’t be manufactured by the Federal Government. State and local governments needs to lead efforts to define resilience and experiment and refine the concepts and then work to request and coordinate resources with other states and the Federal Government. Otherwise we’ll end up with a “one size fits no one” type of program that costs a lot of money, engages in a lot of activity but doesn’t improve anyone’s life. By “break glass in case of emergency” I’m referring to the tendency of the Federal Government to want to create only national assets that are huge, complicated, expensive, and rarely used. The better approach is to develop doctrine, training, and standards. Then we can realize the value of the Federal Government’s investments on a daily basis in communities all across the country and adapt to large scale disasters by mobilizing these smaller units and applying scalable, modular approaches to deal with the peculiarities that large scale events create. Too often Federal agencies avoid simple solutions because they want to be major players instead of enablers.